Spacious and modern apartment accommodation located only a stone's throw from Sydney CBD. Kirribilli Village Apartments provide the ideal accommodation for the leisure traveller exploring the sights of Sydney, the business traveller visiting Sydney as well as those needing temporary accommodation whilst relocating to the city of Sydney. Located on the foreshore of Sydney Harbour, why miss out on those spectacular sights Sydney has on offer? The longer you stay, the cheaper the rate. All types of travellers can take advantage of the discount accommodation at the Kirribilli Village Apartments, as well as the range of modern amenities including faxing facilities, free car parking, lift, tour desk, babysitting service and express check in/out. Milsons Point station is across the road with one stop south to the CBD & one stop north to North Sydney. Ferry is 100 m down the road which has brilliant access to Circular Quay, Darling Harbour and Balmain. 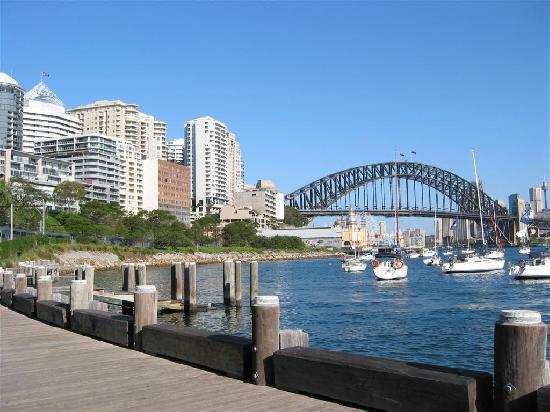 Nearby Attractions : Sydney Harbour Bridge, Luna Park, Kirribilli House, Ensemble Theatre, Royal Sydney Yacht Club. Ferry access with one stop to Circular Quay, Darling Harbour & Balmain. Take the train to the city only one stop away over the bridge. 1 Bedroom Waterviews Apartment : Sleeps up to 3 guests on 1 Queen Bed. 2 Bedroom Apartment : Sleeps up to 5 guests on 2 Queen Beds, Or 1 Queen & 2 Single Beds. 2 Bedroom Waterviews Aparment : Sleeps up to 5 guests on 2 Queen Beds, Or 1 Queen & 2 Single Beds.